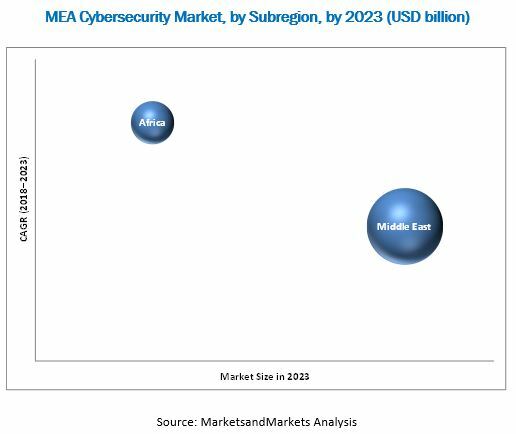 [273 Pages Report] The MEA cybersecurity market size was USD 13.50 billion in 2017, and is expected to reach USD 31.82 billion by 2023, growing at a Compound Annual Growth Rate (CAGR) of 15.2% during the forecast period. The base year considered for the study is 2017 and the forecast period considered is 2018–2023. The objective of the study is to define, describe, and forecast the MEA cybersecurity market by component, security type, deployment mode, organization size, vertical, and region. It also analyzes recent developments, such as partnerships, strategic alliances, mergers and acquisitions, business expansions, new product developments, and Research and Development (R&D) activities in the market. The MEA cybersecurity market comprises key vendors, such as IBM (US) , CA Technologies (US), Check Point (US), Cisco (US), CyberArk (Israel), DarkMatter (UAE), DXC Technology (US), F5 Networks (US), FireEye (US), Forcepoint (US), Fortinet (US), Imperva (US), Kaspersky Lab (Russia), McAfee (US), Micro Focus (UK), Microsoft (US), Oracle (US), Palo Alto Networks (US), Proofpoint (US), Rapid7 (US), Sophos (UK), Splunk (US), Symantec (US), Trend Micro (Japan), and Trustwave (US). These vendors offer cybersecurity solutions and services to end-users for catering to their unique business requirements, productivity, compliances, and security needs. The study answers several questions for stakeholders, primarily which market segments to focus on over the next 2–5 years for prioritizing their efforts and investments. The instances of cyber-attacks in the MEA region are increasing day-by-day. The major motivation behind cyber-attacks includes financial gain, political rivalry, international rivalry, radical religious group interest, cyberterrorism, cyber espionage, hacktivism, cyber warfare, and regional tension. Some of the significant attacks spread by cyber-attackers include malware, ransomware, DDoS, APTs, Domain Name System (DNS) injections, Trojan, backdoor attacks, and other attacks. Cyber-attacks may be targeted on the network, endpoint, application, or cloud environment. Antimalware attacks have infected devices of various enterprises and brought services to a standstill. The downtime of enterprise service due to antimalware results in heavy losses for the company. Ransomware such as WannaCry, Petya, and Bad Rabbit are some of the significant ransomware that have affected enterprises and government organizations on a large scale. Continuously evolving cyber threats have given rise to a large number of government regulations globally, which need to be strictly adhered to by all organizations. Organizations are compelled to meet the mandatory security standards, failing which, a hefty amount of fine is to be paid to the government. Various compliances, such as Health Insurance Portability and Accountability Act (HIPAA), Payment Card Industry Data Security Standard (PCI DSS), and Department of Defense Information Assurance Certification and Accreditation Process (DIACAP), across different industry verticals underline various guidelines and security features that need to be strictly followed. Therefore, the strict government actions for implementing regulatory compliances across the globe are pushing the regional enterprises to deploy cybersecurity solutions for data security. The rise in advanced threats and smarter attack tools require advanced cybersecurity solutions to defend against cyber-attacks. Legacy cybersecurity solutions are not able to safeguard enterprises from the cloud, network, application, and endpoint-related threats. An enormous amount of investment is required for the cybersecurity vendor to come up with technologically advanced products, which is a restraint for cybersecurity vendors. Capital expenditure required for Research and Development (R&D) activity is also high, which is essential for new product development or product enhancement. The dire need for product enhancement persists because if the current security product of the vendor is unable to combat threats, the company’s market reputation is at stake. Vendors have invested heavily in technologies, such as machine learning, Artificial Intelligence (AI), and big data analytics, to come up with products that would provide a strong defense for customers against advanced threats. Companies are unable to adapt to new technologies, and hence, inability to come up with new products or product enhancements, and the high cost of innovation act as restraints to many cybersecurity vendors. Software piracy refers to the unauthorized copying and distribution of software or solutions. There are many types of software piracy; the most prevalent types being softlifting, software counterfeiting, Original Equipment Manufacturer (OEM) bundling, hard disk loading, and renting. Internet-based piracy of software and solutions is one of the emerging issues in the piracy world. Despite the threats associated with piracy, enterprises, specifically SMEs, prefer pirated software, as such software can be easily downloaded via illegal sources over the internet at a minimal price or free of cost. Many companies use pirated software because the original versions are expensive; also, it is understood that legitimate software is not cheap. As a strong correlation exists between cybersecurity and usage of unlicensed software, the continuing usage of pirated security software is one of the biggest restraints that hamper the growth of the MEA cybersecurity market. SMEs are widely targeted by cyber-attackers. According to Symantec’s Internet Security Threat Report 2017, the number of attacks increases as the size of the company reduces. For instance, the companies having employee strength of 251–500 and 1–250 were subject to spam rates of 53.1% and 54.2%, respectively. SMEs focused on the proliferation of sales of their products and services may not always take the aspect of data protection seriously. The progress of SMEs in developed and developing nations directly impacts a country’s economy. SMEs across industry verticals do not have stringent security measures for safeguarding their data, networks, endpoints, and applications. The demand for cloud-based solutions is rapidly increasing across enterprises as the dominant delivery model to meet the IT security needs. Cloud deployment provides flexibility, scalability, and cost-effectiveness to streamline business operations. With SMEs shifting their focus to cloud solutions, cloud-based data protection solution and service providers are expected to witness increasing growth opportunities for safeguarding the data of SMEs from security breaches and vulnerabilities. Cloud service providers deliver and Infrastructure-as-a-Service (IaaS), Platform-as-a-Service (PaaS), and Software-as-a-Service (SaaS) models. IoT refers to interconnected devices that have ubiquitous communication and connection between them. According to Ericsson’s Mobility Report, there would be 18 billion IoT devices by 2022. The widespread use of IoT devices is observed in several application areas, such as smart city projects, smart transportation, vehicular connectivity and autonomous vehicles, smart grids, and smart homes. IoT devices are increasing at a large scale, and various industry verticals are innovating newer technological use cases using IoT devices. Advanced cyber threats target particular vulnerabilities in the network and use these vulnerabilities to get an entry into the enterprise network. With higher sophistication levels of targeted attacks, hundreds of new zero-day threats and APTs have emerged. The methods and techniques, with which the attackers infiltrate into an organization’s network, remain undetected. Advanced threats have significantly increased over the recent years and have become a security challenge for any organization. Such advanced threats are incessantly increasing in volume and complexity, and are persistent, high-profiled, economically motivated, and sometimes even state-sponsored. Cybercriminals use advanced attack techniques to infiltrate into an enterprise’s network, stealing sensitive data, which leaves the organization’s reputation at risk. There lies a big knowledge gap across organizations between understanding the nature of targeted attacks and figuring out an approach to defend such attacks. A holistic method has become essential in terms of awareness and knowledge about such advanced threats and attacks to secure the network infrastructure. Shortage of security skills among security professionals is a burning issue that is eminent across all major security companies. Security teams augment the smooth functioning of cybersecurity solutions and services. Security professionals with excellent cybersecurity skills is a must for security teams that are responsible for handling the functioning of Security Operations Centers (SOCs) and scrubbing centers. Security teams play a crucial role in detecting malware, APTs, ransomware, volumetric DDoS attacks, layer-3 to layer-7 attacks, low and slow DDoS attacks, zero-day attacks, Trojans, backdoor attacks, and other attacks. The security professionals are also responsible for providing services, such as training and education, consultation, and support and maintenance. Therefore, the inability of the security teams to help customers detect and mitigate threats may bring a bad reputation to the cybersecurity vendor. Hence, there is a need for cybersecurity vendors to upgrade their team’s cybersecurity skills as per industry standards. IBM and McAfee extended their partnership to integrate IBM IRP with Data Exchange Layer (DXL) and provide better protection through automation and intelligence sharing. Microsoft partnered with the Government of UK to strengthen the cybersecurity of National Health Service (NHS). Proofpoint launched Cloud Account Defense (CAD), a solution that would help enterprises detect, protect, and remediate Microsoft Office 365 accounts from the evolving thefts, thus preventing data breach. IBM Resilient launched intelligent orchestration with the next-generation of incident response to dramatically accelerate and improve the entire response process. Palo Alto Networks acquired Secdo, an Israel-based incidence response solution provider. With this acquisition, the company would integrate its security operating platform with Secdo’s endpoint detection and response capabilities to offer rapid detection and response services to enterprises from the stealthiest attacks. CyberArk acquired Vaultive, a cloud security provider. With this acquisition, Vaultive would extend its cloud solutions integrated with CyberArk account security solution to highly privileged users who are a frequent target of cyber-attackers. Palo Alto Networks expanded into the MEA region by opening a new office and R&D site in Tel Aviv, Israel. 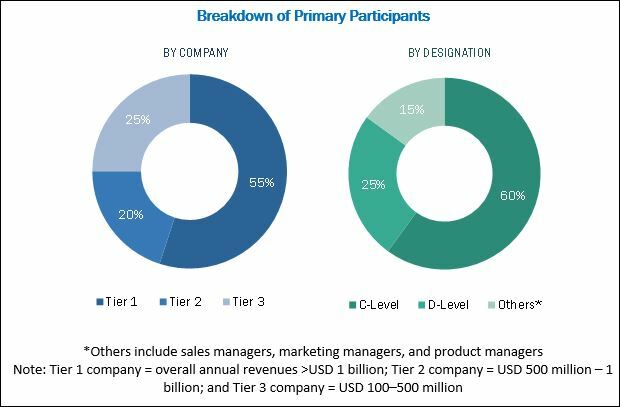 MarketsandMarkets expects the MEA cybersecurity market size to grow from USD 15.66 billion in 2018 to USD 31.82 billion by 2023, at a Compound Annual Growth Rate (CAGR) of 15.2% during the forecast period. The rising sophistication level of cyber-attacks, increasing government compliances and regulatory requirements, and growing proliferation of smart city and digitization projects in the region have led enterprises to adopt cybersecurity solutions and services for detecting and responding to advanced cyber threats and data breaches. Moreover, the Small and Medium-sized enterprises (SMEs) are adopting cybersecurity solutions at a large scale, as they are more vulnerable to cyber-attacks and data breaches. With the adoption of cybersecurity solutions, organizations can effectively maintain and secure their critical information from data breaches and respond to cyber incidents more efficiently. The cybersecurity solutions help organizations optimize employees’ productivity, protect sensitive data and applications, and comply with stringent regulations. Cybersecurity solutions include Identity and Access Management (IAM), risk and compliance management, encryption, Data Loss Prevention (DLP), Unified Threat Management (UTM), Firewall, Antivirus/Antimalware, Intrusion Detection System (IDS)/Intrusion Prevention System (IPS), Security and Vulnerability Management, Disaster Recovery, Distributed Denial of Service (DDoS) Mitigation, Web Filtering, and Others (Application Whitelisting and Patch Management). The IAM segment is expected to dominate the market during the forecast period and estimated to have the largest market size in 2018. The encryption solution would play a key role in changing the MEA cybersecurity marketspace. As a result, the encryption segment is expected to grow at the highest CAGR during the forecast period. The encryption solution enables enterprises to hide their critical data from unauthorized bad actors. The IT and telecom vertical is expected to be the fastest growing vertical, as it has to meet stringent legal and regulatory compliances associated with information security. Small and Medium-sized Enterprises (SMEs) continue to deploy cybersecurity solutions, as they are facing security concerns and cyber-attacks, such as Denial of Services (DoS) attacks, virus, worms, Trojan horse infections, illegal inside activities, and cyberespionage. Middle East is estimated to hold a larger market size in 2018. The increasing need for organizations to reduce the misuse of the internet and enhance their employees’ productivity, and address the incidents of attacks on enterprises’ IT infrastructures is a major growth factor for the MEA cybersecurity market. Furthermore, rapid economic growth, and regulatory reforms and economic stability are expected to drive the growth of the market in Africa. In the Middle Eastern and African region, enterprises in verticals such as energy and utilities, government and defense, and Banking, Financial Services, and Insurance (BFSI), would increase their investments in cybersecurity solutions and services. Security vendors are offering various solutions, including Identity and Access Management (IAM), risk and compliance management, encryption, Data Loss Prevention (DLP), Unified Threat Management (UTM), firewall, antivirus/antimalware, Intrusion Detection System (IDS)/Intrusion Prevention System (IPS), security and vulnerability management, disaster recovery, Distributed Denial of Service (DDoS) mitigation, web filtering, and Others (application whitelisting and patch management) in the MEA cybersecurity market to detect, prevent, and respond to cyber-threats . In addition to this, the security vendors are providing various professional and managed services to support their customers. As the frequency of security breaches has increased over the past 5 years, organizations have increased their IT security investments to protect against advanced threats. However, for many enterprises, including SMEs, these investment costs are a matter of concern. For a strong and advanced security, the cost of innovation is still high. Hence, many organizations view budgetary constraints as a barrier to the adoption of advanced cybersecurity solutions and services. The increasing adoption of cloud-based solutions and services among enterprises would provide significant growth opportunities for cybersecurity solution and service vendors, such as IBM (US), CA Technologies (US), Check Point (US), Cisco (US), CyberArk (Israel), DarkMatter (UAE), DXC Technology (US), F5 Networks (US), FireEye (US), Forcepoint (US), Fortinet (US), Imperva (US), Kaspersky Lab (Russia), McAfee (US), Micro Focus (UK), Microsoft (US), Oracle (US), Palo Alto Networks (US), Proofpoint (US), Rapid7 (US), Sophos (UK), Splunk (US), Symantec (US), Trend Micro (Japan), and Trustwave (US).